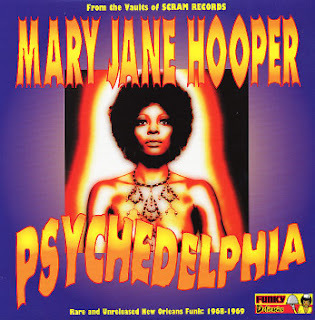 "New Orleans funk diva Mary Jane Hooper remains one of the most shadowy figures in Crescent City soul history. Famed for her collaboration with legendary producer Eddie Bo, many believe she is simply an alias employed by singer Inez Cheatham, although Bo himself disputes such assertions. Hooper is in fact the stage name of one Sena Fletcher, who began her career singing gospel before crossing over to secular R&B backing Lee Dorsey. Upon signing to Bo's Scram label in 1966, Hooper issued her debut single, "Don't Change Nothin'." She eventually moved to Bo's Power label, where in 1968 she cut her best-known single, "That's How Strong My Love Is," later licensed for national release by World Pacific. "I've Got Reasons" followed later that year on Bo's renamed Power Pac imprint, but after the release of the two-part "I've Got What You Need" (justly famed for drummer James Black's monster groove),Hooper effectively disappeared. Her vocal similarities to Cheatham (another Eddie Bo protégée) prompted many funk collectors to assume the two singers were one and the same, further muddying the waters of her history and recorded output. Sorely overlooked by everyone (save for major soul and funk fans) who enjoys soul music, the city of New Orleans was relegated to the backseat by their soul brethren in Detroit, Chicago, Philadelphia, and Nashville, somewhat unjustly. With the recent movement to unearth funk classics and rare vinyl, this wrong has been slowly corrected, most recently with Funky Delicacies' reissue of Sena Fletcher's finest performances. Recording under the guise of Mary Jane Hooper, this collection of singles recorded for Scram Records includes her most well-known hit "Psychedelphia" and is reason alone for beat junkies to consider purchasing this compilation. But there are several other hidden treasures among the pile as well; "I've Got Reasons" and "You've Got What I Want" are but two that could give "Psychedelphia" a run for its money, and Fletcher's version of "Harper Valley PTA" is a beautifully haunting take on the classic "
dope but why cant i see the link? Quite cool! Thanks a lot... love your blog!! how do ya download the tunes please?